1. Preheat oven to 350 degrees. Grease a medium size casserole dish with cooking spray. 2. In a large bowl, stir together the sugar and flour. Gradually stir in the cheese. Add the drained pineapple chunks, and stir until well combined. Pour the mixture into the prepared casserole dish. 3. In another bowl, combine the cracker crumbs, melted butter and reserved pineapple juice; stirring until evenly blended. Spread crumb mixture on top of pineapple mixture. Bake for 25 to 30 minutes or until golden brown. 1) Preheat oven to 350 degrees. Butter and flour 3 (9-inch) round pans; Line bottom of the pans with parchment paper. 2) In a large bowl, combine flour, sugar, baking soda, cinnamon, and salt. Add eggs and vegetable oil. Using a hand mixer, blend until combined. Stir in carrots and pecans. 3) Pour into pans. Bake for approximately 40 minutes. Remove from oven and cool for 5 minutes. Remove from pans, place on waxed paper and allow to cool completely before frosting. 1) Combine all ingredients, except nuts, into a medium bowl and beat until fluffy using a hand mixer. Spread frosting between each cake layer and on top and sides of cake. Sprinkle nuts on top of cake. 1) Preheat oven to 350 degrees. Spray a 9x13-inch baking dish with cooking spray. 2) In a medium skillet, melt 1 tablespoon butter and add onion, celery and pepper. Sauté for about 5 minutes or until vegetables are soft. In a large bowl, combine cheese, corn, green beans, soup and sour cream. Add sautéed vegetables. Pour into the prepared dish. 3) Melt the 4 tablespoons butter in the microwave and mix with the crushed crackers. Spread over the top of the vegetables and bake for 45 minutes or until bubbly. 1. Place the hash browns in a lightly greased 4-quart slow cooker. In a large bowl, combine the soup, cheese, sour cream, salt and pepper. Pour mixture over the potatoes and mix well. 2. Cook and cover on low for 3 ½ to 4 hours or until potatoes are tender. Stir in cream cheese and serve. Deviled eggs look prettiest when the whites are smooth and unblemished, so the shells need to slip off easily and cleanly. Properly cooking and cooling the eggs help this. To begin, place eggs in a single layer in a stainless steal saucepan. (Non-stick is not recommended). Add cold water to a depth of about 3 inches. Bring to a boil of high heat. As soon as the water begins to boil, remove the pan from, cover, and let stand 12 minutes. Drain immediately and fill the saucepan with cold water and ice. Let stand until some of the ice melts and the outside of the eggs feel cool. 1) Preheat oven to 350 degrees. Remove skin from ham and trim fat. Make ¼ inch deep cuts in a diamond pattern and insert cloves at 1 inch intervals. Place ham in a foil-lined roasting pan. 2) Stir together brown sugar, spicy mustard, cola and apple juice. Pour mixture evenly over ham. 3) Bake on lower oven rack for 2 hours and 30 minutes, basting with pan juices every 20 minutes. Remove ham and let stand 15 minutes before serving. 1. In a large saucepan, stir together the sugar and syrups over medium heat. Once smooth, remove from heat and quickly add the peanut butter, continuing to stir until the mixture is fully combined. 2. Add the rice cereal and mix well. Shape the mixture into palm-sized balls with your hands. Transfer to waxed paper. Store in an airtight container for up to 2 weeks. Makes about 12-15 balls. 2. In a Dutch oven, cook the beef and onion over medium heat until meat is no longer pink; drain. Stir in the salsa, chili beans, black beans, corn, tomato sauce and taco seasoning. Bring to a boil. Reduce heat; simmer, uncovered for 30 minutes. 3. In a 9x13 inch baking dish, layer about 2-3 cups tortilla chips; half of meat mixture and 1 cup cheese. Repeat layers. 1. Microwave ingredients in a medium bowl (appropriate for the microwave) on high for 5 minutes or until the cheese is completely melted. Stir after 3 minutes and blend well. Dip can be transferred to a small slow cooker to keep warm. Happy St. Patrick's Day! Need a delicious green dessert for today? Try Chocolate Mint Bars! 2. Unroll the crescent rolls and separate into 8 triangles. 3. If you’re using the large deli slices of pepperoni, place two slices along the wide end of the crescent roll. If you’re using the smaller packaged pepperoni, place 4 slices along the wide part of the crescent roll. Place half of a string cheese in the center of the pepperoni and roll the dough up. Repeat the process with the remaining crescent rolls. 5. Bake for 8 – 10 minutes or until golden brown. Serve hot with pizza or marinara sauce. Talk about the best breakfast for supper (or anytime) food ever, this just might be it. I've always loved Monkey Bread and this recipe is delicious. I've used frozen or fresh blueberries and either work just fine. 1. Preheat oven to 350 degrees. Spray bundt pan generously with cooking spray. 2. Pat out each biscuit on a board and cut in half horizontally. Add two blueberries to each biscuit half and roll into a ball. 3. Combine white sugar and cinnamon in a bowl and roll each biscuit ball in the cinnamon. Put ½ the nuts in the bottom of the bundt pan; add half the cinnamon balls on top of the nuts. 4. Melt the brown sugar and butter on the stove, just until it dissolves together. Pour half the mixture over the first layer of cinnamon balls. Add the other half cup of nuts and the rest of the cinnamon balls. If you have any of the cinnamon mixture left over, sprinkle this on top and pour over the rest of the brown sugar mixture. 5. Bake for 45 to 50 minutes. Remove and let cool about 10 minutes before removing from pan. Drizzle topping over bread. 6. Whisk together the topping ingredients and drizzle over the monkey bread. Check out Crevolyn's latest article in the Gainesville Times here: Food brings people together. There are lots of opinions as to what constitutes the perfect scrambled egg. So this is mine but feel free to share in the comments how you make yours. I’d love to know! In a small bowl, whisk together 3 large eggs, a pinch of salt and black pepper and 2 tablespoons milk (I use skim but you can use whatever you like) until light and foamy. In a medium skillet, add 1-2 tablespoons butter over medium heat. When the butter bubbles, pour the eggs in the middle of the pan (that will force the butter to the edge so that it will be incorporated more into the eggs). Stir the eggs with a rubber spatula. As soon as the lumps of the eggs start to form, turn the heat to low and begin folding the lumps over on themselves and shake the pan gently at the same time. Just as soon as there is no more liquid part of the egg, turn off the heat and transfer to a plate. Some folks say that you should let the eggs rest for about a minute because they’ll continue cooking. I’m not a fan of a cool or overcooked egg so I don’t usually wait even that long to eat it. I love to sprinkle a little grated cheese on my eggs or top my grits with them. Maybe even sprinkle them with some bacon or ham. Now you’re talking. 1. Preheat oven to 500 degrees and lightly spray a baking sheet with cooking spray. 2. Place flour into mixing bowl and cut in shorting with a pastry blender or fork until well incorporated. Stir in just enough milk until dough leaves the sides of the bowl. 3. Turn dough out onto a lightly floured surface. Gently knead two or three times. Roll dough out to ½ inch thickness and cut with a biscuit cutter or small glass that has been dipped in flour. Place biscuits with sides touching onto prepared baking sheet. 4. Bake 8—10 minutes or until golden brown. 1. In a medium saucepan, melt butter over medium heat. Add sugar, flour and cocoa, stirring to combine. 2. Add milk and vanilla, whisking until no lumps remain. Simmer until thickened, about 4 minutes. Serve hot over biscuits. 1. In a large mixing bowl, combine the Cool Whip and cream cheese with an electric mixer until just combined. 2. Add the ice cream to the Cool Whip with a large spoon. 3. Divide the mixture between the pie shells. Cover and freeze for at least 2 hours. Sprinkle with mini chocolate chips before serving. EDITED TO ADD: When I made this pie for Emily's birthday, I added Mini Mint Oreos and used a chocolate pie crust. I garnished with Keebler's Grasshopper Cookies. These Oreos came in a box and can be found next to the regular Oreos at J&J. The Grasshopper cookies are a first cousin to the Girl Scout's famous Thin Mints. Yum! 2. Place the potatoes on a baking sheet and bake for 45-60 minutes, or until cooked through. 3. Meanwhile, cook the bacon in a large Dutch oven over medium heat until crisp. Remove the bacon from the pot, leaving the drippings in the pot. Add the flour to the drippings and stir to combine. Cook, without browning, until the flour and drippings are combined, about a minute. Pour in milk and whisk to incorporate. Cook over medium heat until bubbly and thickened, stirring frequently, about 15 minutes. 4. Scoop out the potato pulp from the skins and add to the milk mixture. Mash with a potato masher leaving it a bit chunky. 5. Add the bacon (leaving some for garnish), 1 cup cheese, salt and pepper. Stir until the cheese has melted. Remove from heat. 6. Ladle the soup into bowls, drizzle with sour cream and sprinkle with remaining bacon bits and cheese. Talk about the best "one-pot wonder" ever, this one may be it! It is a great combination of flavors with just the right amount of everything. 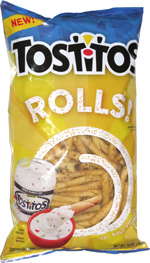 I served it along with these brand new Tostitos Rolls (right next to the regular Tostitos at J&J) and it was perfect! 1. Add the olive oil to a large skillet or Dutch oven and place over medium-high heat over 1 minute. Add the onion, chicken, salt and pepper. Cook for about 5 minutes, until onion softens and chicken is no longer pink, stirring occasionally. 2. Add the rice to the pot and stir. Cook for 3-4 minutes, stirring occasionally. Add the chicken broth, Rotel tomatoes, enchilada sauce, corn and chili powder. Stir and bring to a boil. Reduce to a simmer and cover. 3. Cook uncovered, stirring occasionally, about 20 minutes or until the rice has absorbed all of the liquid. 4. Remove from heat. Add the black beans and stir to combine. Top with cheese and let rest for 5 minutes. 5. Serve warm with toppings. Time Saving Tip: Always keep a garbage bowl nearby when you’re cooking. I saw Rachel Ray do this on her show and I thought it was a great idea. I started keeping one close and realized all of the steps it saved me. Give it a try! 1. Preheat oven to 350 degrees. Spray a 3-quart baking dish with nonstick cooking spray. Set aside. 2. In a large Dutch oven, heat sun-dried tomatoes with reserved oil over medium-high heat. Add flour, stirring well to remove any lumps. Cook until flour mixture thickens, 2 to 3 minutes. Add milk, stirring to combine. Cook, stirring frequently, until mixture thickens and is smooth, 3 to 4 minutes. 3. Add mozzarella, feta, salt and pepper; stirring well. Add spinach and stir. Add pasta and combine well. Spoon into prepared dish. 4. Bake 30 minutes or until bubbly and lightly browned.